She was tired, exhausted of seeking something that she could not find. Why was she there in the first place? In despair, she ran and ran. Looking for a way out. It was getting dark. It was getting cold. She was lost. She began to feel hopeless for she could not see the light in front of her. Her world was caving in. She tried to escape but she could not see the forest for the trees. All she had to do was slow down and feel what was within her heart. But she chose to give in to despair and the forest took her. Have you ever missed the big picture or a solution because you were to involved in the situation? Sometimes you have to step back to see the big picture and this is easier said than done – especially in moments of despair. In this image, the subject is lost in the woods. It’s dark, foggy, misty and perhaps even damp. 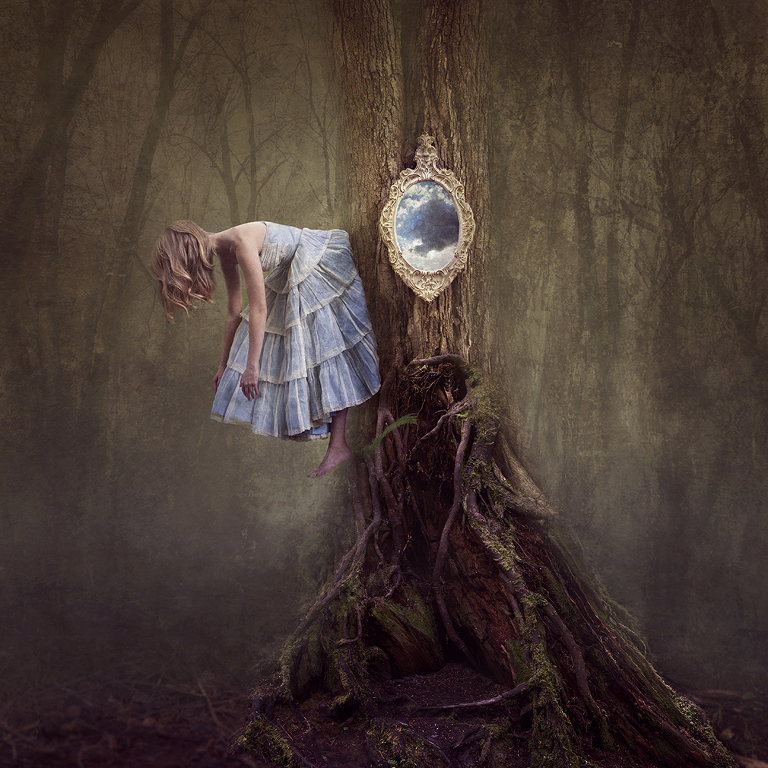 She is dressed in a princess gown pinned to a tree with her head down. How did she get there? Did someone cast a spell on her? Did she give up? Why couldn’t she see the way out just ahead? Was there a loss of innocence? A metaphor for how we view problems now a days? Beauty and the Beast gone wrong? That I leave up to you, my dear reader. What meaning do you see in this image? I would love to read them in the comments below. Above, a little behind the scenes of Lost. Ted is making sure that our model, Monica Rubeck, is safe while posing for our class 🙂 Scroll all the way down for the speed edit. This original image was taken at the Promoting Passion Conference last year in Buffalo, New York. It was part of Brooke Shaden’s class. I was so incredibly excited to learn in person from her. She is one of the most caring, loving individuals I have ever met. When I see her and hear her speak, she is a combination of two really good friends of mine. I adore her work and she inspired me to pick back up composite photography. In November, I purchased one of her images which now hangs in my office. It’s a daily reminder to not give up on the spark in my soul that urges me to create these images. It’s a pure feeling that I have – I cannot explain it. It just is. And I must honor that spark. Thank you Brooke for hosting this conference. It has been a life changing experience filled with meeting the most amazing creatives in the world (We had people from all over the world attend!). Haley - This is such a cool conceptual piece! And awesome you met Brooke Shaden. I followed her back when she first started on Flickr. 🙂 So cool to see the behind the scenes too.